I was going to write a post discussing how B and I worry about our failing memories, and the risks we all face in developing dementia and even downright Alzheimer's. But ... I forgot. Okay, sorry, bad joke. What really happened was Irene, which came washing through here on Saturday afternoon and Sunday morning. We lost our electricity, phone, internet connection. I was out of business. I was petrified that all the water would turn our backyard into a big mudslide and carry it down the driveway, taking out our old, crippled stone wall with it. Miraculously, the stone wall held up. We lost a little real estate, but nothing more than a half inch of topsoil. I also worried about the two big maple trees in the backyard that loom over our house. When we moved here four years ago we had the one closest to the house taken down, and the other two trimmed and wired. Well, thank you Taconic Tree Care. Those two trees stood tall through the storm. But New York State Electric & Gas didn't do so well. We lost power around 5 a.m. on Sunday. We knew it was bad when we called up the emergency telephone number. Usually, when the power goes out (as it does fairly frequently around here), there's a recorded message giving an estimate for the time when the power will be restored. It's typically a couple of hours. But over the weekend the message simply confirmed the power outage, admitting there was no estimated time for restored service. Luckily, the weather turned nice by Sunday evening. It wasn't winter, so we didn't miss the heat. And it wasn't hot either, so we weren't sweltering without our a/c. But there was the problem of water. Not too much water; too little. We live in the exurbs, and even though our house is less than half a mile from one of the reservoirs feeding New York City, we have no piped-in water service. Instead, we have a well. And a pump. And no water if the pump doesn't work. Once the water tank runs out, the house is dry. The situation allows for the washing of hands, the brushing of teeth, and a few flushes of the toilet. No showers. We do have a rain barrel which was plenty full. That came in handy by Monday night. We got out our buckets, filled them up, and kept them by the toilets to refill the tanks. We broke out the candles and the flashlights. B has a hat with little LED lights in the rim -- perfect for lighting up the page. So she spent a lot of time reading books. I borrowed her battery-powered laptop, which worked just fine with ambient candlelight. B's son went off to work on Monday morning. He works at a bank in town, and the downtown stores were first to get their electricity restored. B plies her trade at the town library, which had no power on Monday, so she had the day off. I spent the day hanging out at our local upscale grocery store which has a seating area with power outlets, allowing me to recharge the battery on the laptop. At one point I took a break and went over to Panera's, which offers wi fi access along with the power outlets. B and I went out to dinner Monday night. As we ate B made plans for her anticipated day off on Tuesday -- a trip to the mall, some time at the laundromat, and she wanted to shop for the new refrigerator she's hoping to get. Tuesday morning dawned another bright sunny day. Still no power. B and I went up to the diner for breakfast. Alas, on the way home her cellphone rang. Power was back on at the library. She had to go to work ... with no shower, for the third day. I spent another day commuting between the grocery store and Panera's with a small crowd of like-minded laptop users. Around 4 p.m. I went to my sports club and did a workout while watching TV (which I hadn't seen for three or four days). I also took a nice long hot shower. B got home and we decided we'd better cook something out of the refrigerator. As the odor emanating from behind the refrigerator door proved, there were a couple of hundred dollars worth of slowly rotting food in there. We fired up the outdoor grill and cooked some salmon and hamburgers from the freezer. They were defrosted, but still cold. After dinner we drove to a local cafe for tea and dessert. We deserved it! The place was mobbed with powerless people, suggesting a kind of a party atmosphere. But on the way home, I finally started complaining. I was tired of playing the pioneer. Yeah, it was a big storm. Lots of trees were down. But everyone knew it was coming. They should have been prepared. And NYSEG had three days of perfect weather to get those power lines back in operation. What were they doing? The big housing development out on the main road was still dark. A bar on that stretch of road had its lights on -- I assumed the owners had a generator, giving them enough power to run a refrigerator and a beer tap. We turned the corner into our neighborhood. Was that a light? No, those people on the corner have a generator. Wait ... another light. Then as we came around the corner we saw our front porch light was on, and the floodlight by the garage. "The lights are on!" B shouted. "The lights are on!" I chorused. So I apologize for my grousing, NYSEG. Good job. I know there are people in our area who still, on Wednesday morning, don't have electricity. Others are pumping out basements. Still others are cutting up tree limbs. I wish them well. And the people in the Catskills, who suffered some bad flooding. And people in Vermont got it bad. And plenty of roads in New Jersey are still closed. Not to mention all the people in the Carolinas. But I'm sure glad we have our power back. If I can remember, I'll post that piece on memory in a few days. Meantime, for those who might be interested, I wrote a piece for the U. S News & World Report website, picked up today on the Yahoo! finance page. Take a look. Thanks! Did you ever play dodgeball when you were a kid? One person would stand up against a wall -- in our case it was the side of our house next to the driveway -- while all the other kids lined up about 20 feet away. The kids had tennis balls -- or sometimes the big kids would use basketballs -- and they would throw them at the person against the wall. If your ball hit him, you got a point. If you missed, the ball would ricochet against the wall and bounce back. Then you got another shot. But if the kid who was "it" caught the ball, then you were "it" -- and it was your turn to stand up against the wall to take your punishment. One day we were playing against the side of the house, and I had scored lots of points and was in the lead. My sister Nancy was "it" and I got her several times in the stomach and chest and shoulder, and scored a number of points. But then she suddenly turned and caught my throw. So I had to take the wall. I dodged a throw from Dennis Rawlings. He had a weak arm, and his throws were easy to avoid. I parried one throw after another from several kids, when suddenly there was an explosion in my face. Nancy had thrown a ball that smacked me in the nose. Nancy was two years older than me, and she did not have a weak arm. Blood spurted out. My knees gave way. And I slipped down the side of the wall. Nancy ran over to me. My mom kind of relied on her to keep an eye out for me as we roamed around our neighborhood and played with kids on the street, so you can see why she might have been a little worried -- since she was the one who'd given me a bloody nose and put me to the ground. "Lie down, Tom," she urged. I didn't need any prompting. I was already most of the way down. So I lay my head back onto the driveway, crunching against the pebbles, and looked up at the pale blue sky. Nancy hastily scraped together a pile of pebbles and made a little pillow for my head. Somebody went in the house and brought back a handful of paper towels. Nancy used the towels to try to stanch the flow of blood. It didn't work very well. Five or six kids hovered over me. They looked a little blurry to me, as they murmured about the blood and wondered if I was okay, and commented on the sticky liquid leaking down my face and dripping onto the driveway. "Maybe I better go see if anyone's home," suggested Dennis Rawlings. His father was a doctor, and he often came to the rescue of the kids on the street. He had patched me up once when I was pretending to be a handyman, hammering a nail into a board, and on one overenthusiastic backswing had hit myself in the head with the claw of the hammer. And it was Dr. Rawlings who came to my rescue one evening when I ate a spoonful of dishwasher soap. My mother had left it on the kitchen counter. "Why did you eat it?" my mother had asked incredulously, after Dr. Rawlings had induced many rounds of vomiting. "I thought it was sugar." I'd shrugged. But kneeling in our driveway, my sister didn't think it was a good idea to call Dr. Rawlings. "Don't do that," she told Dennis. "Go in our kitchen and get some ice out of the freezer. That might help. I want to stop this bleeding before my mom gets home." Dennis ran into the house as I lay there with blood oozing out of my nose. He came back with an ice tray. Nancy yanked the lever on the metal tray, crunched out some ice cubes and wrapped them in a fistful of paper towels. She held the ice up to my nose and told me I was going to be okay, as she urged me to please stop bleeding, and telling me that she didn't want Mom to find out about this. I didn't know how I was supposed to follow her instructions. How do you try to stop bleeding? But I was hoping for the bleeding to stop, too, because soon the water from the melting ice was dribbling down my face and making me very uncomfortable, and my pebble pillow had gone from soft and warm to pointed and prickly. Finally, I was able to stand up. Nancy kept the ice pack on my nose as she helped me stagger into the house and up the stairs. She brought me into the hall bathroom, closed the lid on the toilet, and sat me down. She tilted my head back. "Here, hold this," she said, taking my hand and placing it on the ice pack. "Just stay here for a few minutes. Don't get up." She paused on her way out the door. "You'll be okay," she concluded. "And remember, Mom doesn't have to know about this, right?" A few minutes later she came back to check on me. Mom had come home, she reported. I should just go into my room and lie down for a while. She had a damp cloth with her, and she wiped off my face, trying to be gentle about it so she wouldn't start the bleeding again. The cloth felt cool. I stood up and looked in the mirror. The blood was gone. But my face looked red and puffy. "Stay up here for as long as you can, until Mom calls you for dinner," Nancy said. "And when you do come downstairs, pretend nothing happened." Nancy left, and I sat back down, feeling sorry for myself. Eventually, I got up, wandered into my room and sat down on the bed. I picked up my teddy bear and held it for a while, staring a the Smokey the Bear sticker I had on my window. That made me feel better. Then I turned to the wall. I had a little project I was working on. I had a plaster wall, and I'd begun to scratch at it, digging into it with my finger. Once I'd broken through the paint and the outer skin of the plaster, the material was soft and crumbly. For some reason I found it very comforting to pick at the wall and feel the plaster give way, crumbling into a powder beneath my fingers. Over the months I'd hollowed out a hole about as big as my fist. My parents either never noticed the hole, or else they didn't really care, but whenever I couldn't sleep at night, or was sent to my room by my mother as punishment for some infraction, I went to work on my wall, scraping at the plaster, watching the powder tumble down the wall to the floor behind my bed. That afternoon I scraped at one edge of the hole, widening the opening and smoothing out the sides. Finally, my mother called me. I got up and went down the hall and into the bathroom to give my face an inspection. It felt as though there was a big clot of blood inside my nose. I had to breathe through my mouth. But from the outside it didn't look too bad. I went down the stairs and into the kitchen, trying to look casual. My mother glanced over at me in the doorway. "What happened to you?" she asked. She came over and inspected my face. "Did you get in a fight?" she queried. Then my mother went into the living room. I trailed behind her. Nancy was sitting on the sofa reading a book. "What happened to Tommy"? my mother wanted to know. Nancy looked up from her book. She glanced at me, then turned and looked my mother straight in the eye. "He got in a fight with Dennis Rawlings," she finally said. "I tried to stop it," Nancy went on. My mother wheeled around to me. "Tommy, go to your room!" "Right now. Go to your room. Get upstairs." I shot a hateful look at Nancy, then turned and started up to my room, where I went back to work on my plaster wall. John Maynard Keynes, the British economist who lived from 1883 - 1946, was by far the most influential economist of the 20th century. His ideas were adopted by Franklin D. Roosevelt to battle the Great Depression, as the President expanded government spending, created federal works projects and ran up a big federal deficit. Critics argued that these Keynesian economics were flawed -- that the Depression really didn't end until World War II -- but everyone, even Republicans, credited Roosevelt with making great strides in overtaking the Depression, sending aid to drought-stricken farmers, feeding millions of people, giving them work, and setting the stage for an economic boom for the rest of the century. Historians credit FDR with saving capitalism and democracy. By the early 1970s Republican President Richard Nixon had to admit, "We're all Keynesians now." Keynes theorized that during recessions, the public gets frightened and holds back on spending. This causes the economy to decline further, as less spending leads to poorer business conditions which is turn leads to more layoffs in a vicious circle of economic decline. The way to break the cycle, said Keynes, is to pump government spending into the economy. FDR did this by building roads and bridges and parks and dams, even hiring people for pointless, make-work projects, just to get them into a job and a paycheck. Roosevelt went so far as to hire unemployed writers for a Federal Writers' Project. They traveled around the country and produced guide books on the states and various cities and regions. In a nutshell, Keynes challenged classical economic theory which posited that free markets are self regulating and by themselves produce full employment. Clearly that theory is not correct -- or at least it's not correct all the time. Keynes argued instead that aggregate demand is what determines overall economic activity. If demand falls short, it leads to recessions. And then the public gets frightened, holds back on spending, and the economy goes into that vicious decline which produces persistent high levels of unemployment. Keynes's economic approach fell out of favor in the 1980s under President Reagan and his supply-side economists. But President Bush brought back Keynes in response to the 2000-2001 recession. Bush lowered taxes, ramped up spending and ballooned the budget deficit in order to pump up aggregate demand. So what would Keynes do now, in 2011? Let's speculate. 1) Clearly, he would engage the federal government to rebuild America's infrastructure -- building roads, reconstructing bridges, laying down rail lines, updating the electric grid, developing alternative energy sources, maybe even reinvigorating the space program. Remember, it was FDR who created the alternative energy projects of the 1930s, from the Hoover Dam to the Tennessee Valley Authority. 2) Keynes proposed the concept of price stickiness -- the idea that labor quite understandably, but not practicably, refuses to lower wages in response to falling demand for workers. He might very well support budget-strapped governors from California to New York, and a lot of places in between, who are resisting wage and benefit demands from state and local workers. Higher wages for a few means fewer jobs for everyone else. And unlike the federal government, states cannot create money and run a deficit to boost economic activity. 3) Keynes said that if money being saved exceeds the amount being invested, then unemployment will rise. Think of all the money currently being hoarded on American corporate balance sheets (Exxon has $10 billion, Apple has $28 billion, Google has $39 billion!). He very likely would be in favor of lowering corporate taxes on funds that corporations hold abroad, encouraging them to bring the money back home and invest it here in capital improvements and in more jobs. He might also try to unlock the savings of wealthy individuals, and get that money into the hands of people who would spend it. One way to do this would be to abolish the ceiling on the payroll tax, then lower the overall payroll tax rate -- transferring money from high earners who tend to save it, to lower earners who will spend it. 4) Keynes felt that countries should not run large trade deficits or surpluses. He would likely favor lowering the value of the dollar even more, to boost American exports and improve the balance of trade. And that's another reason he would support the development of alternative energy sources (and perhaps more drilling as well), since oil imports contribute mightily to our trade deficit. 5) Finally, Keynes believed in deficit spending not as a good in itself, but only as a strategy to improve economic conditions. He argued that World War II should be paid for not by issuing more debt, but largely out of higher taxation. Today, he would likely push for more federal debt in the short term, but also for a more balanced budget in the long term. He might very well support Medicare and Social Security reforms that would "bend the cost curve down" on these programs. But he was also not opposed to higher taxes. To the extent that higher taxes would not reduce demand, he would be in favor of increasing taxes on the super-rich, the near rich, and the plain old rich. Deny Thy Disease, or Embrace It? 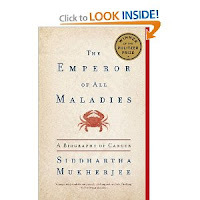 There's a book going around my circle of friends called The Emperor of All Maladies by Siddhartha Mukherjee. B read it a couple of weeks ago. Then we went to a party over the weekend, and another woman started talking about it -- she'd read it too and really loved it. B had the book with her, because she had borrowed it from another person who happened to be at this party and she was going to return it. Instead, one of the guys got interested, so he ended up taking home the book to read. I have not read it. I have no interest in reading it. I don't know why anyone would want to read it. It's all about cancer. Nevertheless, I was curious and wanted to know what was so great about the book. First of all, B told me, it's really well written. 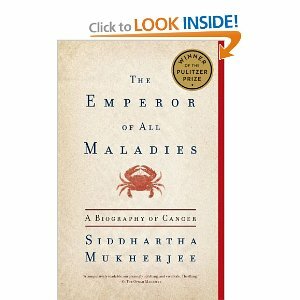 Dr. Mukherjee was a Rhodes scholar; he works as a cancer physician at Columbia University; and the book won a Pulitzer prize. He weaves in the history of cancer, the experiences of patients, the struggle of doctors to find a cure, along with the science of cancer and how it works. So, do they know how it works? I asked. Not really, she said. They've made many discoveries, and developed a number of weapons in the battle against cancer. But after reading the book, it doesn't seem to B that they're anywhere near finding a cure for cancer. She reported that they have made more progress on some cancers, less on others. For example, they have found a cure for the blood cancer, Hodgkin's lymphoma, not because they know how the cancer works, but because they figured out how this particular cancer is spread and how to stop it. As she knows, my brother died of Hodgkin's lymphoma, in 1964. Coincidentally, one of my daughter's best friends contracted Hodgkin's lymphoma a couple of years ago. She had some treatments, including chemotherapy. She temporarily lost her hair. But in the end she was cured. She is now a medical resident at a hospital in New York. But that's one of the reasons why I do not want to read this book. I already know that Hodgkin's lymphoma is now curable, when before, it wasn't. Do I really want to read all about how the disease that killed my brother, and almost destroyed our family when I was a teenager, is now a perfectly curable malady that is, yes, an inconvenience, but no longer a death sentence. Don't get me wrong. I'm glad they've made progress on cancer and found a cure for Hodgkin's. I'm happy for those people like my daughter's friend who contract the disease today, and live to tell the tale. And I think it's really great that my daughter's friend is now a doctor -- and that she recently got married. But do I want to have my nose rubbed in it? My whole family has a history of cancer. We have strong hearts. But my mother got breast cancer in her 50s, and ultimately died of cancer, although she managed to soldier on until age 89. My dad also died of cancer, although, again, not till late in life. And one of my sisters has had breast cancer. I figure that cancer is gonna be what gets me in the end. My time will come, eventually. Do I want to wallow in the details now? I don't think so. The woman who started talking about the book at the party, who thought it was a masterpiece, is younger than I am. She's only 50. But she herself has had breast cancer. She found the book riveting, she wants to study cancer and find out all she can about the disease. I think she feels that it empowers her. Not me. I'd start in on the book, and I'd be reading about cancer symptoms, and I guarantee you, when I lie down to go to sleep at night, I'd start feeling a pain in my chest or a lump in my throat, and I would absolutely convince myself that I have cancer, probably a very advanced stage of a very aggressive cancer, and that I'll be undergoing chemotherapy within a week, and I'll soon be weak and emaciated, with scars zippering my chest, and no hair on my head, and weighing in at about 95 pounds. Just like my brother. I didn't explain this whole thing to the breast-cancer survivor who likes this book. I just told her that I didn't want to read the book. I didn't want to know all there is to know about cancer. I want to stick my head in the sand and keep it there for as long as possible. Look, I'm not in denial. I gave up smoking a long time ago; I eat my antioxidents and avoid the nitrates in bacon and hot dogs. I try to get some exercise, and I've had a couple of colonoscopies thank you very much. I do what I can to avoid cancer. But beyond that, what's the benefit in reading all about the disease and the horrors it brings to people's lives? I told my friend I wouldn't mind reading a book about heart disease. For me, that's an intellectual exercise. But cancer cuts too close to the bone. She thought I was crazy. She actually said that, in kind of a friendly but dismissive way, "You're crazy." Ed Koch, mayor of New York City from 1978 to 1989, was famous for meeting people on the street and asking them, "How am I doin'?" Perhaps when he started he was fishing for compliments, I don't know, but that's certainly not what he got. What he got was an earful. But Mayor Koch was a tough New Yorker and could take some criticism, and soon it became his trademark: "How am I doin.?" And that's how he found out what people were thinking, what issues they were concerned about. Well, to bawdlerize a famous political line -- If you knew Ed Koch, you'd know that I am no Ed Koch. Nevertheless, the other day I noticed that I passed the 10,000-all-time-page-view mark on my blog. I've been blogging for a little less than ten months, so I don't know if 10,000 views is good or bad, or about average. (Do we have to be competitive?) But I thought it seemed an appropriate time to pause and consider what I'm doing here. As might be expected, I started slow, with barely a hundred page views the first month, then gradually built up my views, according to blogger stats -- which may or may not be accurate, but no, I do not count my own page views -- to a little over 2,000 views per month. I slacked off my blogging a bit in June, since I was busy doing an assignment for which I was actually being paid, and I fell back to about 1,500 a month. Now I'm back up to about 1,800. I might fall back again in September, though, since I have another paying job coming up which will cut into my blogging time for a while. I don't know why I've focused on the views per month, rather than all-time views, or views per week. I guess I figure the monthly numbers smooth out short-term fluctuations that may have nothing to do with my blog and give me an overall trend. I really have no basis to compare. What figures do other bloggers use to size up the response to their blogs? Aside from overall views, I've noticed that some subject matters get more response than others. For example, when I post a "memoir" -- some reminiscence from when I was a kid -- I don't seem to get that many views. People who do check out these posts seem to like them; but the items just don't draw as many viewers. That shouldn't be surprising. Why would anyone else care what I was doing when I was a child? But still and all, I like to write them, so I'll keep on doing them now and then. I hit on the idea of doing a series called "Remember Him?" and "Remember Her?" from some site that pops up on either aol or yahoo! called "Memba Them?" The site posts then-and-now photos of Hollywood personalities, usually minor stars from long-ago TV shows. Some of the photos are mug shots, and it's a pretty cheesy site, but it gave me the idea to look back at some of the memorable luminaries of our youth so we can reflect on their significance in our lives -- and then I thought if I made a kind of "game" of it, presumably it would be more fun. I notice that these posts have become more popular, the more I do them. So I hope people are catching on, and enjoying them. The most popular posts I've done have had the word "Retirement" in the title, or "Social Security." I suppose that shouldn't be surprising, since I'm putting up this blog for like-minded individuals who are in my own demographic group -- retired or semi-retired people in their mid-50s or older. I don't have any special expertise on this subject, except I do have a business degree so I know a little bit about money -- and also, I've done a lot of reading on the subject because, like you, I am actually going through the process. And there's nothing to focus your attention on something like going through the process. I did notice, however, that the single post with the most views is not about money or retirement, but about an issue that's perhaps political, or social, or maybe ethical. It posed the question: Do you think success is basically due to luck? Or is success achieved primarily through personal effort? And it posits that how you answer that question goes a long way toward determining what your political point of view is. By the way, although a lot of people were interested enough to read the post, not everyone agreed with my premise. That's okay. I don't blog just to have people agree with me. In fact, some of the most intriguing comments on my blog posts have been those questioning my argument or my conclusion. I hope other bloggers feel the same way. As I said, I find the best comments are either those that disagree with me, or else those that add something -- some fact or point of view -- that I hadn't thought of before, or else a few times when people have given me helpful advice about my dental problem, or the issue I had renting my condo, or when my computer went kerplooey. Because blogging is not just a writing experience, it's a learning experience, and I have definitely been impressed with the quality of the blogs I've run across, from some impressive people with backgrounds involving writing books, reporting for newspapers, appearing on TV, working in finance or for the government or as a teacher. But even more than the reading and writing of blogs, I've enjoyed the back-and-forth conversations with a bunch of different people from all over the country -- even all over the world. I like trading views with bloggers from Ohio, Virginia, Florida, the Carolinas, as well as Arizona, New Mexico, California, Oregon, and Canada, the UK and Germany. 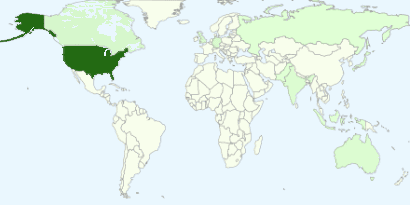 Finally, when I go on my "Pageviews by Country" I really get a charge out of seeing a smattering of people checking out my blog from Indonesia, Australia, India and Russia. Russia ... imagine that! So hello to Russia, from a guy who as a little kid used to sit under his desk at school when there was an air raid drill, a guy who had a grandfather who may or may not have immigrated from Russia (he was a pretty shadowy character, but that's a whole other story), a guy who's never been within a thousand miles of Russia but who likes the idea of reaching across the world and saying, "Hi!" I've been going to my dentist for several years now. It's a group practice, where they do not guarantee you the same dentist every time you go, but I've managed to mostly see a young woman who I trust and who seems to know what she's doing. There's a degree posted on her wall. She graduated from University of Maryland dental school in 1999. I went to the periodontist. He was very decisive. I had a "broken root" and the tooth had to come out. The remedy is to replace it either with a bridge or else a dental implant, he said, confirming what my regular dentist told me. The periodontist said he could do it; or else I should go to an oral surgeon. But he told me, no matter who did the job, to make sure they replaced the part of my bone that was decayed. He billed me $85 for the consultation and gave me a price for his work: $3,605. And that did not include the new crown that would have to be put on the new implant. So I went back to my dentist, as she had asked, and we discussed my alternatives. We agreed the dental implant was the best thing to do, but she said I should go to the oral surgeon that was part of their practice. Why not go to the periodontist she'd sent me to for the second opinion? I asked. Because he's a periodontist, she said. You should go to an oral surgeon. Besides, she said, by keeping it "in house" I would get a little better price. It so happened I could get in to see the oral surgeon right away. He was in the office two days a week -- Monday and Thursday -- and this was last Thursday so he was there. I was escorted into one of the little rooms. The assistant told me she wanted to take an x-ray. I told her my regular dentist had taken an x-ray, and I didn't like getting too many x-rays, so maybe the oral surgeon could just look at hers. He could do an x-ray if he thought it absolutely necessary, but I'd rather not. The oral surgeon rushed in about five minutes later, without doing an x-ray. He was a young guy with a beard. Pretty abrupt manner. He confirmed that the tooth had to come out; that a dental implant was the best option. And it so happened that he had a cancellation and could get started right away. Would I like to do it? I balked. I thought, well, it's gotta be done. No reason to delay. But it all just seemed too fast. So I told him, no, I needed time to process all this information. Could I make an appointment for next week? Sure, said the oral surgeon. No problem. He was actually going on vacation next week, but we set up an appointment for the following Thursday, August 18. Then he said he'd give me a prescription for an antibiotic, and a mouth rinse. Start taking the antibiotic three days ahead of the surgery, he told me, and do the mouth rinse as well. He assured me that mine was an easy case, with a 95% success rate. He'd never had a problem. He would scrape away the infection and the diseased bone, pack in new bone and set the screw. As far as I was concerned, the procedure would be like getting a cavity filled. Some Novocaine and maybe a bit of a sore mouth. Then, after the bone healed, in three or four months, I'd come back to get my new tooth. As I left, I stopped to pay the bill for the consultation. $161. (I noticed the bill was almost twice as much as the periodontist's) And I got the estimate for the treatment. The oral surgeon would charge me $2,869 (Which I noticed was a few hundred dollars less than the periodontist.) And then the charge to get my new crown would be an additional $2,160. The dentist doing this special crown would not be my regular dentist, but another person in the practice -- someone I'd been to before and liked. I went home, still stunned by the cost of this implant, wondering if I should do the less expensive bridge (although no one told me how much less expensive it would be). And I was thinking I'd been given a little bit of a sales job, feeling they'd been trying to rush me into this treatment. So I turned to the internet and googled the name of this oral surgeon. I found out he practices in The Bronx. He has a partner who's connected to New York University. But this oral surgeon was not listed as a member of the American Dental Association. My regular dentist was listed; so was the periodontist she recommended me to; so was the other dentist in her office who would do my special crown. I tried the American Association of Oral and Maxillofacial Surgeons. I found his partner, the dentist connected with NYU. But I did not find this particular oral surgeon. I finally did find a reference to this oral surgeon. He was listed as a "new diplomate" in the Summer 2010 issue of the publication of the American Board of Oral and Maxillofacial Surgery, which certifies that the person "has attained competency in a recognized specialty through education, training and clinical experience," and "represents a practitioner's commitment and expertise in consistently achieving superior clinical outcomes." That was somewhat comforting, to know this oral surgeon had attained this "diplomate," even if it was only a year ago. But I wonder, how much experience does he really have. So I'm at a loss about what to do. I am still shocked at the price of the dental implant. But I could come up with the money. And I really, really do not want to get the cheaper bridge and live to regret it two or three years down the line if it starts causing problems. But I don't want a problem with a dental implant either. And I'm a little worried that the oral surgeon at first wanted to operate right away, and then, only when I delayed, decided to give me the prescription. If it's important why was he willing to proceed without it? And why isn't he listed, as all the other dentists are, in the ADA or the AAOMS? Just because he's new and hasn't gotten around to it yet? And yet, I trust my regular dentist, as well as the other dentist who's slated to do my special crown. And she didn't hesitate to send me for a second opinion with the periodontist, which to me is a good sign. So, I don't know. I guess I'd appreciate any reaction from anyone who's had experience with a dental implant or bridge, or even just anyone who reads this account and gets the feeling that either I'm being overly cautious and gun shy, or whether I have a legitimate concern and should start looking around for another solution -- although I don't know what it would be, because my tooth hurts and I don't want to have to start at the beginning and do this all over again, with a still perhaps less-than-guaranteed way to proceed. One way you know you're getting on in years? When the highlight of your day is a trip to the grocery store. Or supermarket. Does anyone know why some people call it the grocery store, and others the supermarket? My ex-wife was from Cleveland, and she maintained only people from the Northeast say grocery store. According to her, people from Ohio say supermarket. Of course, my ex-wife also maintained that Ohio is not in the Midwest. According to her, Cleveland is less than 200 miles from Buffalo, NY -- so how could it be the Midwest? The Midwest is Iowa and Nebraska. Maybe she's right. I'm no expert on the Midwest. Or grocery stores. I just think grocery store is an old-fashioned word for supermarket. Anyway, I found myself driving to the grocery store this morning ... and really looking forward to it. I knew it would be the highlight of my day! I'll admit it, I love going to the supermarket. My favorite is Stop & Shop. I also like Shoprite. I do not like the A&P -- it's dark and dingy and I never get the feeling that the food is fresh. Never been to a Whole Foods. I'm just not the type. I do like Publix, but not Winn-Dixie, when I'm down south. Anyway, I know a guy who works the checkout at Stop & Shop in the mornings, so I always make a point of saying "hi," and catching up on his life. There's a Starbucks at my grocery store, too, and I'll often get a cafe latte or cappuccino. I'm not really a big Starbucks fan (the coffee's too strong and bitter for my taste, not to mention too expensive), but B doesn't like me to drink more than two cups of coffee in the morning, so this way I can have two at home, and then hit up Starbucks for my third. Don't worry, I usually get a Tall or Grande, not the Venti or supersized Trenta. Yesterday, I was going mostly because B was having a friend over for breakfast and I wanted to get out of the house. But I needed to get some shaving cream from the Health and Beauty aisle, and I thought I might need a new toothbrush, and B wanted me to pick up a 5 lb. bag of potatoes so she could make potato salad. No problem. I'll do anything for potato salad. But I love to wander around (while I drink my Grande) and get an eyeful of all the wonderful wares around the store. I headed for the produce section, found the five-pound bag of white potatoes. And then ... oh, the red potatoes are on sale. I love red potatoes. So I put a bag in my cart. Saved 50 cents. I went over to the fish counter, just to see what they were preparing for the day. Didn't buy anything. Then I recalled that we'd had fish for dinner the night before, and B said we were out of tartar sauce. So I found the condiment aisle, spotted the tartar sauce, and then also picked up some horseradish sauce as well. I knew we were out, and I love horseradish sauce on my sandwiches. Well, I won't bore you with my entire Stop & Shop experience. Let's just say I entertained myself for a good half hour, or 45 minutes. Got a gallon of milk, because B's son who lives with us glugs milk day and night. And ... well, the ice cream was on sale, so I just had to pick up some ice cream. Three half-gallons for $8. I wasn't sure if the sale counted if you buy less than three. No problem. I bought three. But the moment I realized that the grocery store would be the highlight of my day came when I arrived at the Health and Beauty aisle. I was assaying all the different toothbrush choices when I suddenly noticed the music. I like the music they pipe in at the grocery store -- and by the way, this is how you know you're getting on in years, if you like the music they pipe in at the grocery store. There's a lot of 50s and 60s music, but some more modern choices as well -- light rock, pop songs, or alternative music. So you get plenty of pleasant background music at the grocery store, some of it original, some more obviously piped in reinterpretations. But here's the song that stopped me in the Health and Beauty aisle. I stood there, listening to the song, thinking to myself: How lame is this? I don't just like the music; here I am stopping what I'm doing and really listening to it! But then again ... this is a good song, one of Coldplay's first hits (altho' kind of a disturbing video). So if you want, you can share in my grocery store experience. Just take a listen. She was born in San Francisco in 1938 to Russian parents, and named Наталья Николаевна Захаренко. You'd think a name like that might hold you back, but she was acting in movies by the age of four. Her paternal grandfather, who worked in a chocolate factory, was killed in a fight between Red and White Russian soldiers in 1918. Her father was born in Vladivostok, then immigrated to Montreal, then San Francisco. Her mother originally came from Barnaul, in southern Siberia, and grew up in the Chinese city of Harbin, dreaming of becoming an actress or a ballet dancer. Shortly after she was born, her mother insisted on moving the family to Los Angeles to pursue a career for her daughter, who now "Americanized" her name to Natasha Zacharenko. 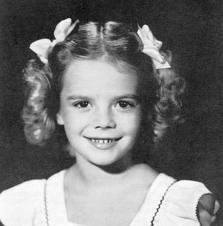 She made her film debut with a bit part in a 1943 movie called Happy Land. Two years later she got the part of a German orphan opposite Orson Welles and Claudette Colbert in Tomorrow Is Forever. Welles later commented that the young girl was a born professional, and "so good she was terrifying." She appeared in 20 films as a child actress, then at age 16 made the transition to a teenage ingenue -- in a role that won her a nomination for an Academy Award as Best Supporting Actress. Her Best Supporting nomination came in 1955 for her role in Rebel Without a Cause, playing opposite James Dean. Shortly after that, she won the Golden Globe Award as best new actress of the year. She starred in several other top movies, including Marjorie Morningstar, Bob & Carol & Ted & Alice (she played Carol), and West Side Story, a movie that won ten Oscars, but none for the leading lady, who by now was known as Natalie Wood, playing Maria. Natalie Wood married actor Robert Wagner in 1957. They divorced in 1962. She married British producer Richard Gregson in 1969. They had one daughter, and then got divorced in 1972. She married Robert Wagner a second time in 1972, and they remained together until her death in 1981, at the age of 43. It was the day after Thanksgiving. She and her husband and a few friends were anchored off Catalina Island on their boat the Splendour. She reportedly slipped and fell off the yacht. A woman on another boat said she heard cries for help. The cries were answered by someone, who said, "Take it easy, we'll be over to get you." The cries lasted about 15 minutes altogether, and then ... nothing. Her body was found in the morning; she was wearing a light jacket, a nightgown and socks. There were fingernail scratches on the side of the boat's dinghy, suggesting that Natalie Wood tried to climb back up into the boat. A lot of partying was going on at the marina that evening. There were reports of arguments between Wagner and the actor Christopher Walken, a guest on the boat that night, who was rumored to be having an affair with Natalie Wood. The ship's captain also claimed he heard Wagner arguing with his wife. The coroner found that Wood had been drinking, perhaps seven or eight glasses of wine, and finally, her death was ruled an accident. More than a thousand mourners attended her funeral, including Frank Sinatra, Gene Kelly, Rock Hudson, Fred Astaire, Elizabeth Taylor and Gregory Peck. Natalie Wood had her star placed posthumously on the Hollywood Walk of Fame in 1987. It is located at 7000 Hollywood Blvd. The Midlife Crisis Queen hosts the Blogging Boomers Carnival this week, marveling that we've all managed to live long enough to see the year 2011. Jeez, I can remember when 1984 seemed very far in the future, and recall thinking that 2001 was an odyssey so distant into the future that it would probably never happen. Ah, well, tempus fugit. Anyway, at www.midlifecrisisqueen.com/ you can ponder the march of time ... as well as find a new blogging boomer, catch a link to some great tech-friendly products for seniors, and survey other issues of concern those of us who are of a certain age.